Perhaps the most intriguing and unique of all of the Mexican Mopars is the short-lived, third generation Ramcharger. Engineered on a shoestring budget and dipping into the Chrysler parts bin, the ’99 Ramcharger represented the last gasp of the once popular two-door, full-size SUV format. Two-door SUV sales had been in terminal decline. Full-size SUVs had graduated from being mere workhorses, fast becoming a regular sighting on suburban driveways throughout North America. The Chevrolet Suburban’s name finally seemed apt. The full-size two-door models had fallen by the wayside, too impractical for many shoppers and perhaps too large for others. When the Ford Bronco gave way to the new, handsome Expedition, the only body style available was a four-door SUV. And although GM built prototypes of a two-door GMT-800 (above), the project never advanced. The bodystyle remained popular in Mexico, however. 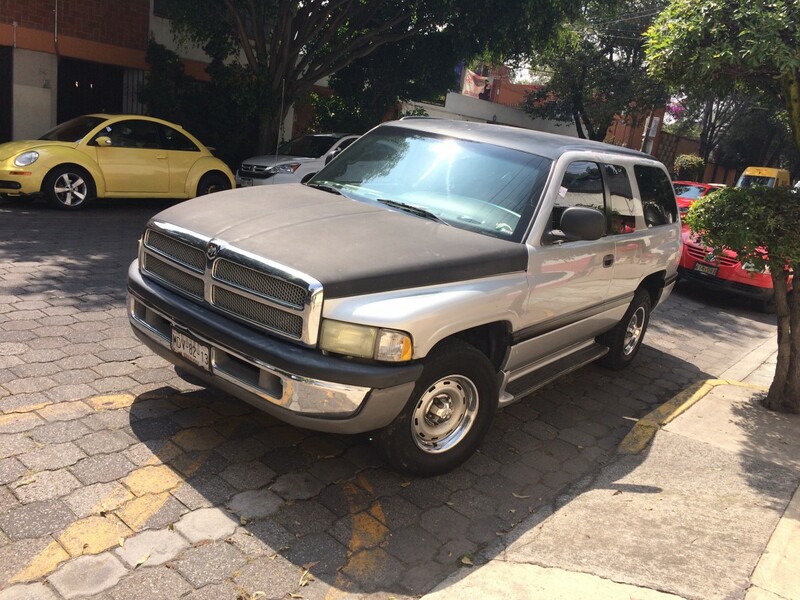 In the US, the Ramcharger was axed in 1994 but the SUV continued to be manufactured in Mexico until 1996. With no replacement lined up, the nameplate took a leave of absence. 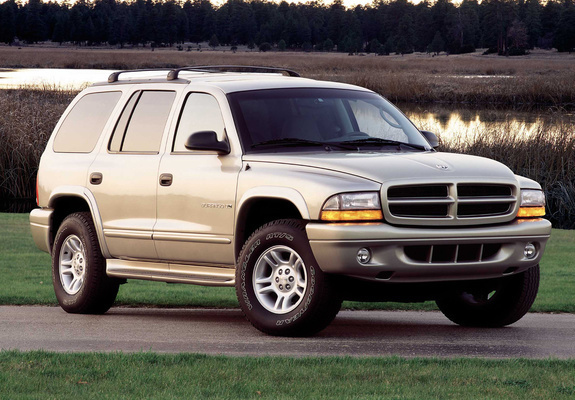 This left the Durango as Dodge’s largest SUV but, although it was slightly larger than rivals like the Ford Explorer, it was very much in the shadow of the biggies from Ford and GM. There was still demand for a full-size, two-door SUV in Mexico, so Chrysler’s Mexican operations managed to put together a new Ramcharger in just 24 months with a budget of only $3 million. To keep costs down, the ’99 Ramcharger used the tailgate of the Dodge Caravan and the rear-quarter windows of the Ram Quad Cab, but used a new frame due to the Ramcharger’s shorter wheelbase—113.7 inches, with a total length of 198 inches. Interestingly, the Ramcharger was available with a pair of side-mounted third-row seats which meant this two-door SUV could seat 8 people. The Ramcharger was available with a choice of 5.2 and 5.9 Magnum V8 engines with a choice of automatic or manual transmissions. However, the truck was produced only in rear-wheel-drive—building a 4WD version would have significantly increased development costs. 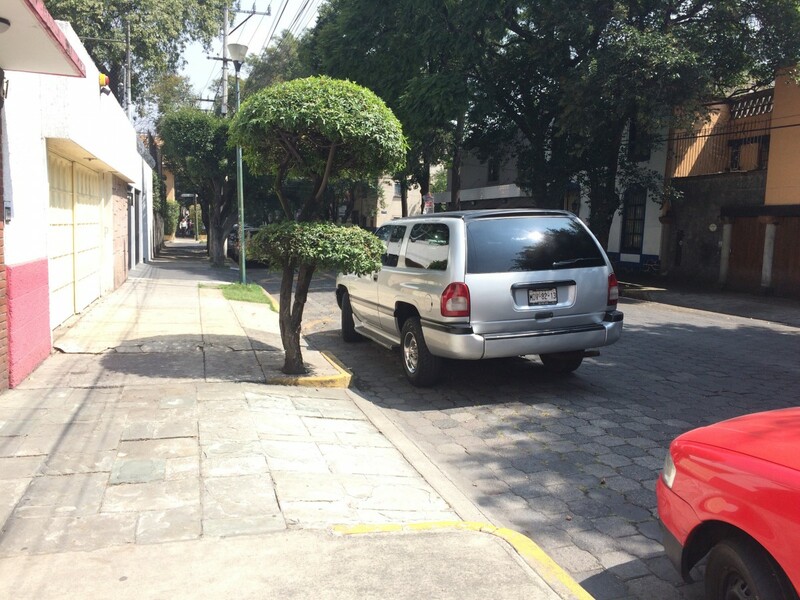 Despite the lack of 4WD, the Ramcharger was well-received by critics in Mexico. Alas, it was the buyers that weren’t as enthusiastic, even though the truck was cheaper than a similarly-specified Durango. The third generation was sold for only 3 years with just 30,000 units produced in total. There is a common belief that the Ramcharger could not have been sold in North America as it would not have met the more stringent safety standards. 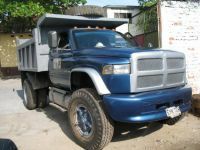 The Mexican market has always taken a more laissez faire approach to safety, and the base Ramcharger even went without airbags and anti-lock brakes. However, one of the designers on the project, Javier Galnares, told Motor y Volante that the truck was designed to meet US safety standards. So, the Ramcharger may not have been imported for any number of other reasons: torpid sales for trucks of this style; the lack of a 4WD option; and the potential cannibalization of Durango sales. Chrysler missed out on some heady years for SUV sales during the early-2000s boom time in North America. To this day, there has not been another full-size SUV built off of the Ram platform despite encouraging remarks about the idea from Chrysler executives. And while sales of full-size SUVs eventually came back to earth, a present-day Ramcharger could prove to be a profitable beast for FCA. I have a suggestion for FCA executives: if you want to develop a new Ramcharger but you don’t want to spend too much, ask your Mexican colleagues to take another stab at it. Ramcharger photographed in Coyoacán, Mexico City. Nice vehicle. Too bad it wasn’t feasible for the North American market. What’s the story on the Chevy, another Mexico-only model, a homebuilt, or photoshop? Prototype. Good thing, too…bless its heart. I saw one of these a few years ago south of the border, but I only saw the front. Your picture of the back of it William blew me away. I totally thought I was looking at a Caravan! Never knew there was a 2 door GMT-800 prototype, it looks pretty good! I only learned about these here on this site a few years ago. 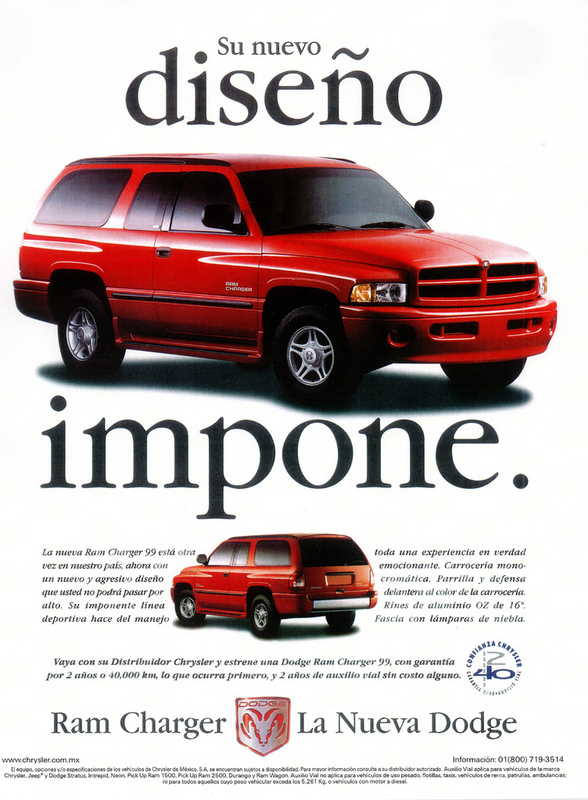 I recall reading at the time that Dodge kept toying with a Suburban-clone for the American market, but they kept delaying and finally killed it. I wish I had a camera back in the mid 90s when I saw a guy with a custom-built one. They could have sold a bunch of them in the second half of the 90s. I was living in Las Cruces, NM while I was in college. 30 miles north of El Paso, TX and Juarez, Mexico. I saw so many Mex market cars driving around locally, and I remember seeing these several times. I remember being behind one and realizing that the tailgate was a minivan piece. I was thinking of how much the taillights looked like Caravan units (which, were shared with the US Durango)… and then noted the similarities of the tailgates. I didn’t realize, however, that the 1/4 windows were shared with the Ram Quad Cab. Now that I know, I can’t not see that. Point of order: Mexico is part of North America, as is every Central American country. I gotta say, I kinda like the look of this, and I wonder how it would have done in the U.S.. Might have been panned as being too similar to the Ram truck, but this in 4-door might have done the trick. Definitely a good-looking rig. If it was already developed, I’m surprised they thought that the cost to federalize it (when designed with US standards in mind anyhow) would outweigh the potential profits given the SUV boom. That 2-door GMT800, on the other hand? No, thanks. Very awkward to my eyes, due mainly to the rear wheel appearing too far back in the chassis, plus the awkward transition between the straight door edge and the parallelogram window. Great find! I’ve only seen a few pictures of this car before, having never really read into it much. I never knew that they used the taillgate from the NS minivans, but now I can see it clearly in the pictures. The taillights also look very similar, only contoured a bit on the outside to match the Ram Charger’s rear sheetmetal. Definitely a franken-vehicle, and the short wheelbase and tall height give it a decidedly clumsy, top-heavy look. Even if it was sold in the U.S. with 4WD, I don’t think it would’ve sold very well. You do bring up a good point about Chrysler having never offered a 4-door RAM pickup-based SUV though. I think it may be too late for that now. How would a 4×4 version have been too expensive to develop? Wouldn’t be “plug-n-play”? It would have been an interesting choice, but Americans had started to show a strong preference towards four-door SUVs long before 1999. On the other hand, I’m glad that GM was just a pipe dream. 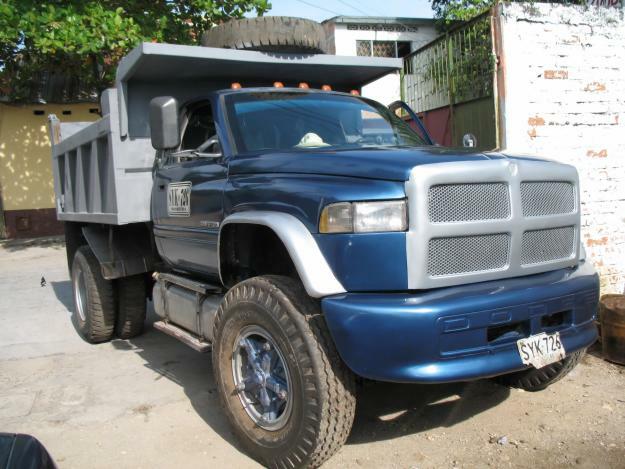 The 1978-1997 Mexican Dodge medium duty trucks are also interesting. Geebuz… I thought that GM abortion was a terrible Photoshop… Yikes! That thing redefines UGLY! A bit of trivia: these Mexican Ramchargers don’t use the US/Canada/Mexico Voyager-Caravan taillamps with the red turn signals. Instead they have a version of the European Chrysler Voyager taillamps, but with clear plastic and an amber bulb for the turn signal rather than the European Voyager’s amber plastic and clear bulb. No, they do not. You can clearly see they don’t have the same shape. The vans have curved edges at the base of each side on either end of the vehicle. Not the Ramcharger. The Ramcharger units also flare out slightly at the same point they meet their fender crease. The vans don’t. I think what you’re seeing is accounted for by tricks of the light (reflections in the shiny lens plastic), not a difference in shape. When I saw a few of these Ramchargers in person (in Tucson, AZ) it was clearly the GS minivan taillamp with just two colours of plastic instead of three. Take it from an owner… not the same. It has to be larger to account for the additional width of the truck body. I wish they were the same, much easier to source if it gets broken. OK, I was pretty sure I was right, but I could certainly be wrong. 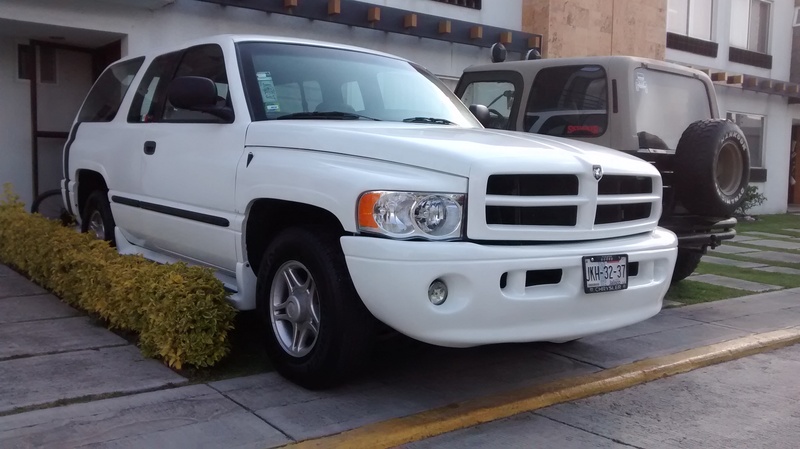 Was it always “Ram Charger” (two words) in Mexico or was that used only on the final-generation model? I think it was just one word – Ramcharger – in the US. I never knew there was a two-door GMT-800 prototype. Those would have been cool. I just bought a 2000 ramcharger now I am looking into how I can bring it to Canada any ideas?